5ug of total protein from (1) Arabidopsis thaliana leaf extracted with Protein ExtrationBuffer, PEB , (2) Spinacia oleracea total cell, extracted with PEB, (3)Hordeum vulgare total cell extracted with PEB, (4) Zea mays total cell extracted withPEB, were separated on 4-12% NuPage (Invitrogen) LDS-PAGE and blotted 1h toPVDF. Blots were blocked immediately following transfer in 2% ECL Advance blockingreagent (GE Healthcare) in 20 mM Tris, 137 mM sodium chloride pH 7.6 with 0.1% (v/v)Tween-20 (TBS-T) for 1h at room temperature with agitation. Blots were incubated in theprimary antibody at a dilution of 1: 10 000 for 1h at room temperature with agitation. Theantibody solution was decanted and the blot was rinsed briefly twice, then washed oncefor 15 min and 3 times for 5 min in TBS-T at room temperature with agitation. 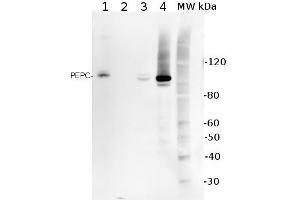 Blots wereincubated in secondary antibody (anti-rabbit IgG horse radish peroxidase conjugated,from Abcam) diluted to 1:50 000 in 2% ECL Advance blocking solution for 1h at roomtemperature with agitation. The blots were washed as above and developed for 5 minwith ECL Advance detection reagent according the manufacturers instructions. Images ofthe blots were obtained using a CCD imager (FluorSMax, Bio-Rad) and Quantity Onesoftware (Bio-Rad). Indications d'application Recommended Dilution: 1 : 1000 with standard ECL (WB). Conseil sur la manipulation Please, remember to spin tubes briefly prior to opening them to avoid any losses that might occur from lyophilized material adhering to the cap or sides of the tubes. Once reconstituted make aliquots to avoid repreated freeze-thaw cycles.